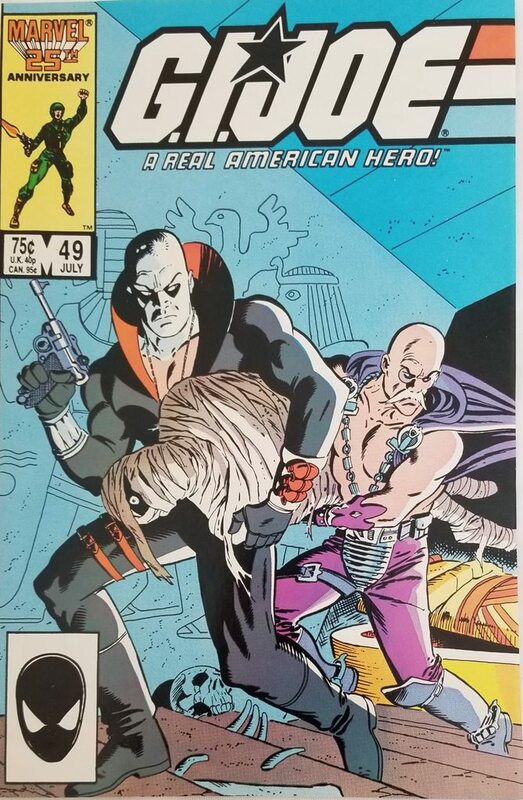 This issue begins with Destro and Dr. Mindbender getting into trouble during a daring grave robbery somewhere in the Mid-East. 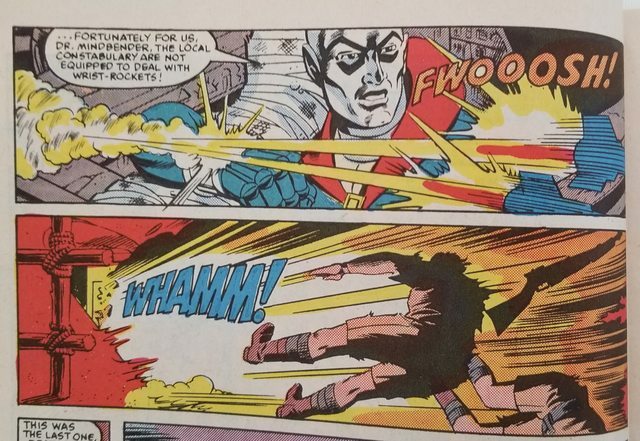 Destro blows up the local police with wrist rockets. Feel free to check local "constabulary" in your thesaurus. 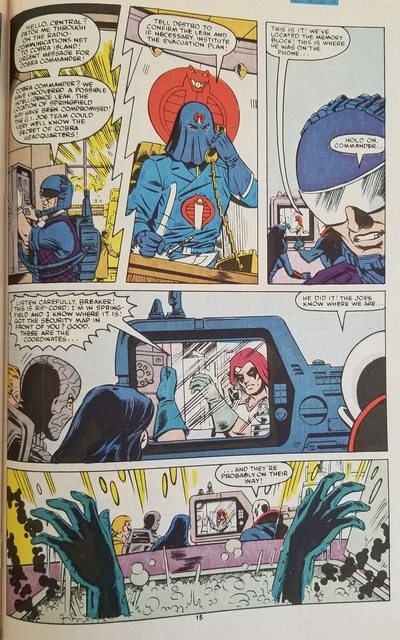 Destro is often portrayed as a man of honor, but also he has no problems using violence for purposes of completing the mission and preserving his own life. 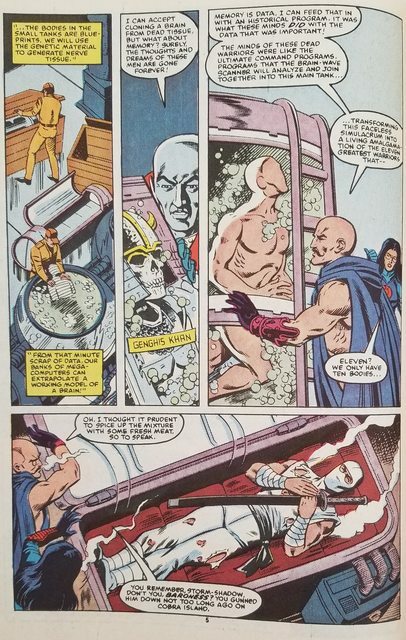 The Baroness helps Destro and Dr. Mindbender ex-filtrate with a wrapped mummy-like body. 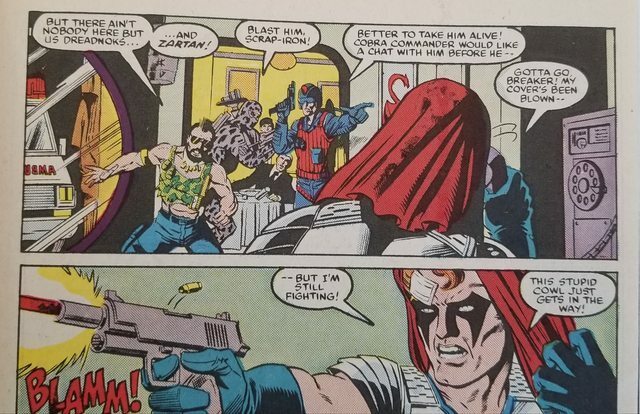 Cobra Commander and the Crimson twins Tomax and Xamot discuss Dr. Mindbender's plan to clone a super soldier from DNA of some of history's greatest warriors. 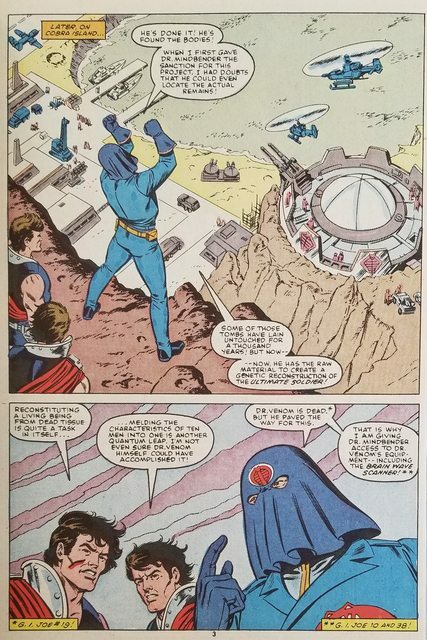 Cobra Commander believes it can be done, but the brothers are skeptical. 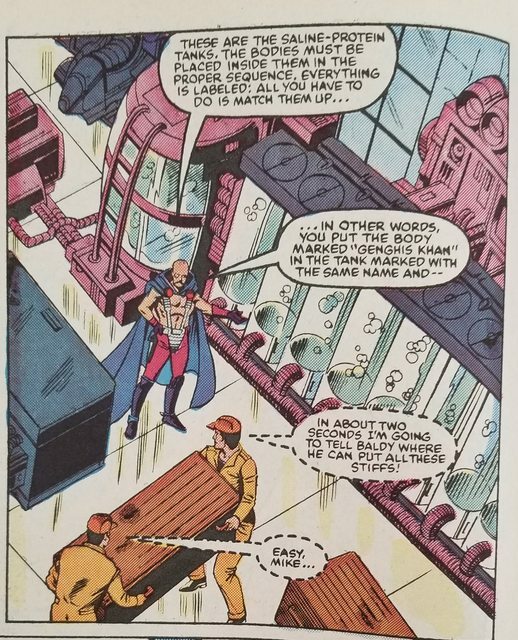 Dr. Mindbender micro-manages Cobra troopers dressed as warehouse delivery workers. They are bringing bodies into Mindbender's lab. There are several vertical tubes filled with liquid along one wall. One of the Cobra troopers mumbles unkind things under his breath. 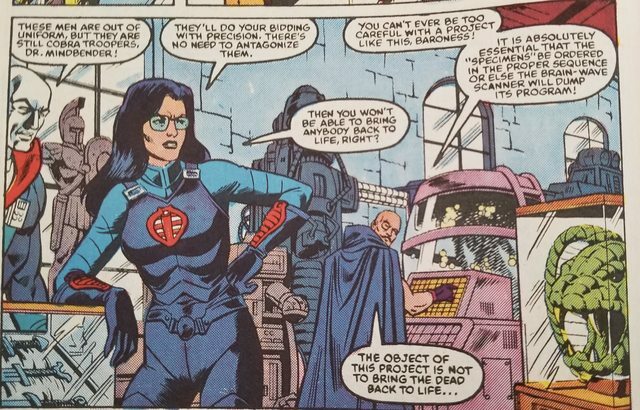 Destro, the Baroness, and Dr. Mindbender continue exploring the science project. They don't want to resurrect the dead. They want to synthesize a new life comprised of several different dynamic personalities from history. Evidently, creating a blank "simulacrum" in a floating equivalent of a Bacta tank and stirring DNA can lead to the "blank" becoming a composite of all those historical warriors. They decided to add the newly dead Storm Shadow to the mix of the DNA. 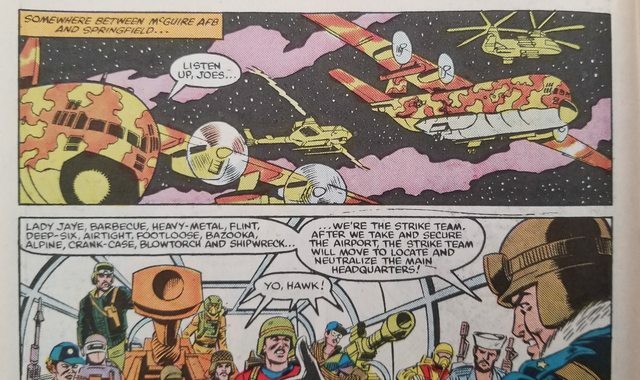 Nearby, the Dreadnoks are enjoying themselves at a Tiki lounge, when Firefly and Scrap-Iron burst in and break up their party. 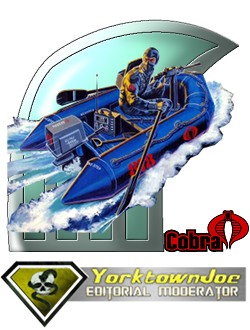 Ripcord, disguised as Zartan, had made a call to Joe HQ providing the location of Springfield, Cobra's secret city. Unfortunately, his call got traced by the Tele-Vipers monitoring outbound calls. Now "Zartan" has got "some 'splaining to do." Actually, they don't even want to question him, they just open up with small arms fire on him. 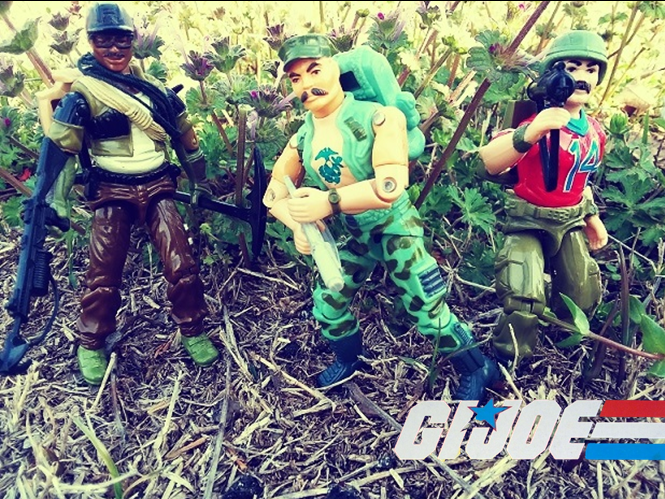 Ripcord intends to evade and elude Cobra forces and wait for the Joe's. He crashes through a window and sprints away. Back at the Pit, General Hawk briefs the team on the immediate battle plans to rescue Ripcord and stop Cobra in Springfield. Since Springfield is an American city, I think he must have checked in at some point with the President to suspend Posse Comitatus due to the unique threat of Cobra operating domestically. After he had been spoken down to by the Jugglers in the previous issue, you would think he might be more careful a single issue later. But Hawk is a man of action. Ripcord tries to steal a car from an undercover Cobra, but his daughter is in the car. 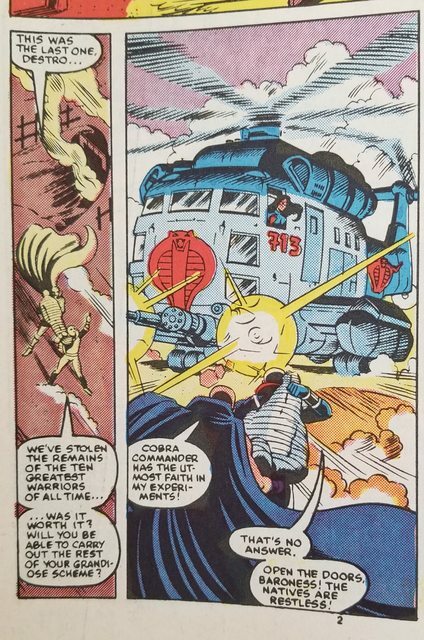 The Cobra/civilian prevents Scrap-Iron from destroying his car with a missile. His daughter has been inadvertently kidnapped during the grand theft auto Ripcord pulled off. 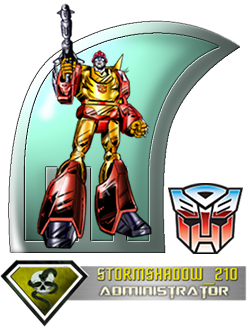 Destro expresses concerns that the simulacrum might have Storm Shadow's physical attributes and a divided loyalty. 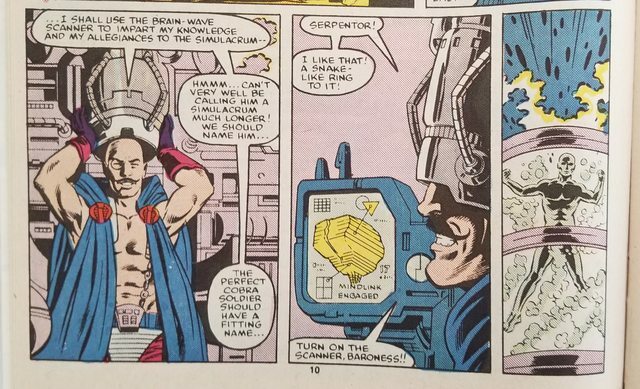 But Dr. Mindbender has it covered. 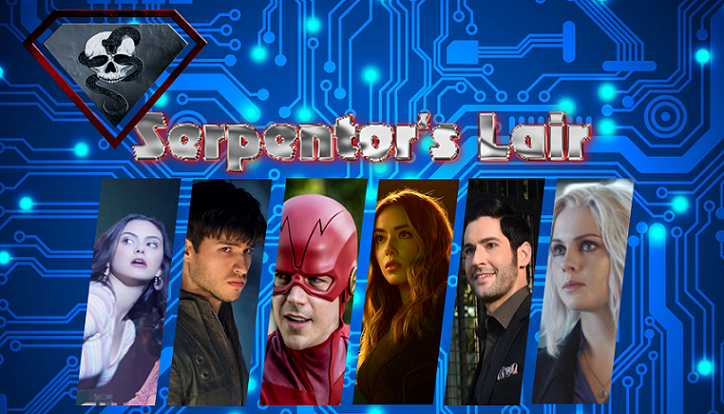 He is going to transfers his knowledge, thoughts, and loyalties and project them through Dr. Venom's Brain-Wave scanner onto the simulacrum to insure modern knowledge and Cobra loyalty. Ripcord is in big trouble. 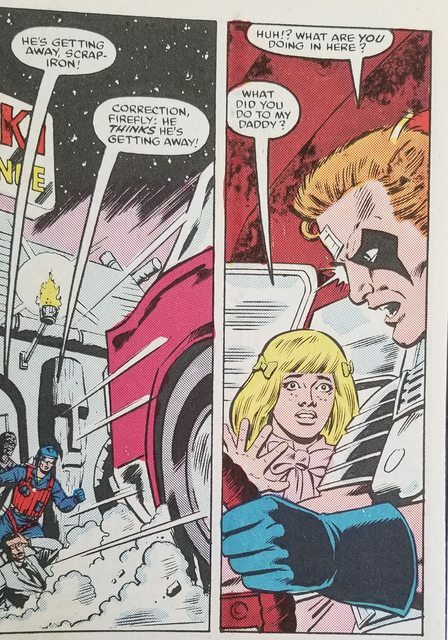 He stops to let the little girl out of the car, but she must be part of the Cobra Youth (see Issue 33) or the Crimson Kids. 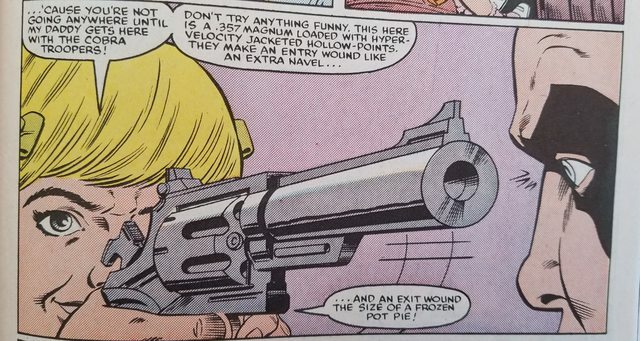 She points a .357 Magnum at him and starts making ballistics and wound analogies. Stalker briefs his team of Joe's on their mission objective while in flight. The Joe's have darkened face camo on, since the mission is intended to happen during the night, under cover of darkness. It becomes evident that the Joe's have been informed about Cobra's secret location in Springfield. It is time for them to shutter up the buildings and flee to Cobra Island for refuge. 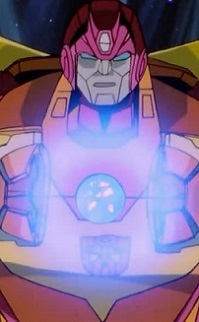 The rotten little girl turns over Ripcord dressed as Zartan to the Dreadnoks, Firefly, and Scrap-Iron. Back at the lab, a bare naked simulacrum has risen from the holding tank. Thankfully, he is hidden in the dark shadows, and we are allowed to keep from witnessing Marvel comics from running foul of the Uniform Comics Code. Plus, it's a family program. He warns of an impending strike team on route. The simulacrum seems sentient, and fully aware of his surroundings and circumstances. The Joe strike team is indeed in flight and on the way. 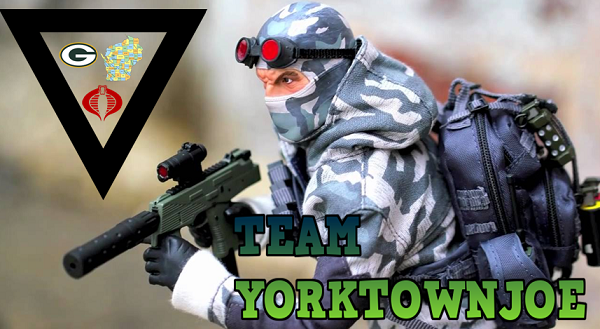 Scarlett and Snake-Eyes prepare some charges to take down the city's power grid. The blank simulacrum is questioned as he gets dressed. Also, they name him Serpentor. He replies that he remembers other names, but doesn't care. "Serpentor" will do for the time being. 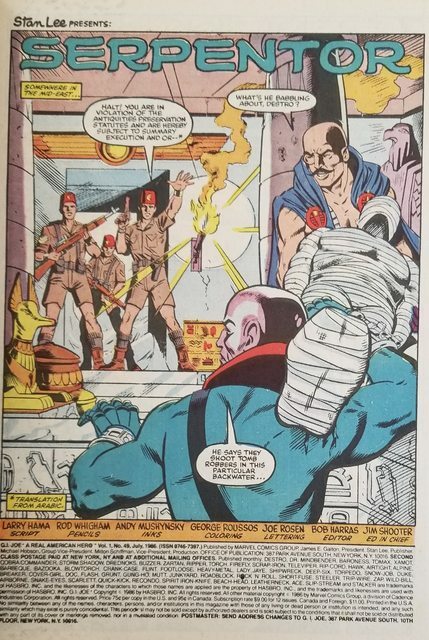 Destro still doubts Serpentor's loyalty. This seems like a reasonable concern, especially since he literally just appeared on the scene a few minutes before. 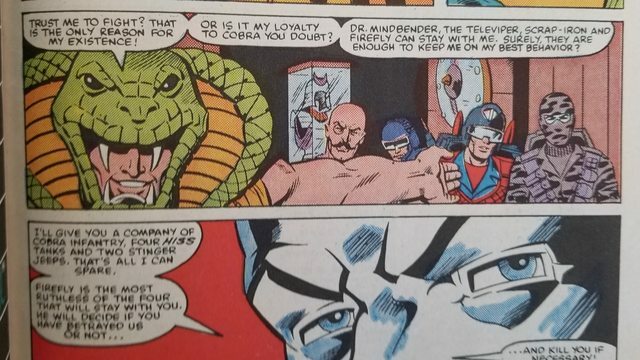 Serpentor suggests leaving Firefly, Scrap-Iron, and Dr. Mindbender with him to keep him on track. They will lead the holding action to prevent the Joe's from stopping the main evacuation to Cobra Island. Since the Island has diplomatic relations, they can feel relatively safe there. This does sound a bit grim for Serpentor and those left behind. 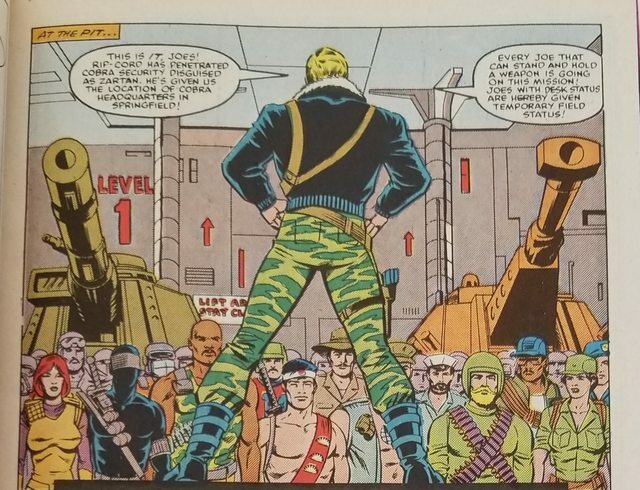 At the issue closes, Serpentor addresses a group of Cobra soldiers tasked with holding or delaying the Joe's impending attack on Springfield, and we get a glimpse into his inner thoughts thanks to the thought/speech bubbles. He understands that soldiers never change, they all want to be inspired by similar speeches. Most importantly, soldiers want to know that their mission is noble, and there is a plan for success and survival. So this issue delves deeply into the more "science fiction" strand of the G.I.Joe legend and mythos. Synthesizing DNA harvested from various decaying corpses is not something we can do now, let alone in the 1980's. 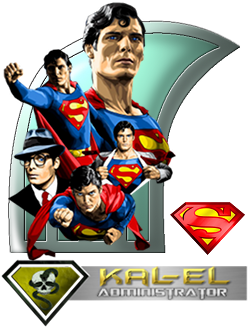 But Larry Hama proves ahead of the curve on human cloning as a viable possibility for a story arc. And for someone who is supposed to be a super "soldier" Serpentor is bossing people around very early in his present existence. We will have to wait until the next issue to see what happens in the upcoming Battle for Springfield. Tune in soon for Issue 50. 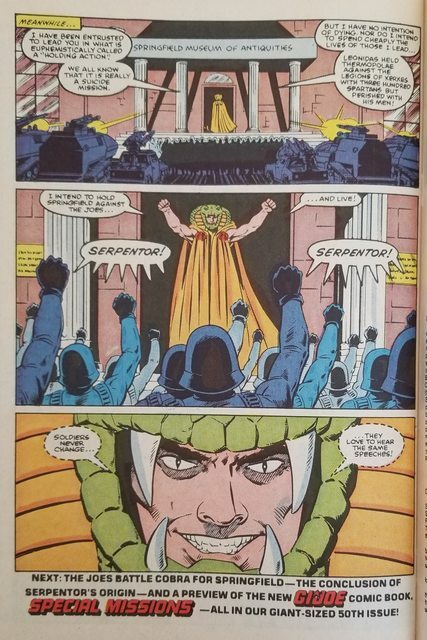 Now You Know - a little more about: ”SERPENTOR” Feel free to let me know what you thought of this issue in the comments. Comic book serpentor is so much better than Cartoon Serpentor. First off, using Storm Shadow's DNA and not involving Sgt. Slaughter in the whole thing is a huge improvement. 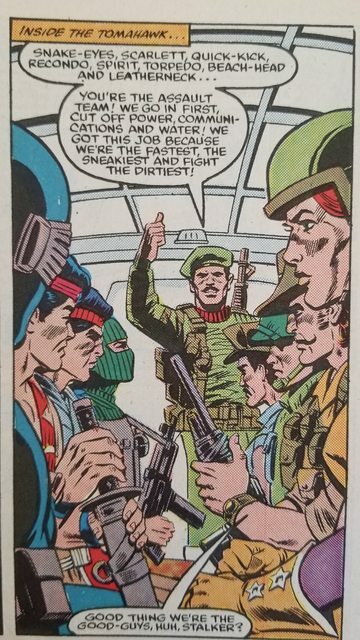 Then, the fact that Serpentor is actually better at being Cobra Commander than the Commander himself, which ends up leading to the epic Civil War story arc, all good stuff. Then all of the mystery surrounding his body in the freighter, we are getting into some really juicy issues coming up. Glad you liked it! I just updated a few typos. Feel free to edit any more if you find them. It is interesting as this is one of the times the 'toon and the comic both addressed the same topic, albeit in a slightly different way. In the end, Serpentor comes to life in both continuities. 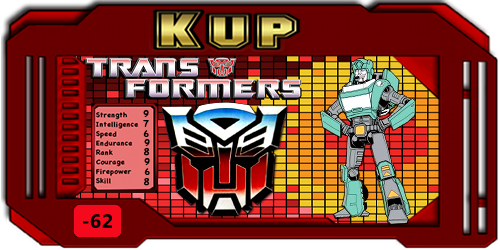 I'm not sure how toy sales went, but Hasbro was certainly pushing this character hard in their 3 tiered advertising campaign. When i was a kid i thought Serpentor was about the coolest thing ever. I got a second hand figure of him with no air chariot. Now i have several, and i still love the character. I think he gets a bad rap because of a lot of his bad dialogue in second season of the cartoon. I got to say. 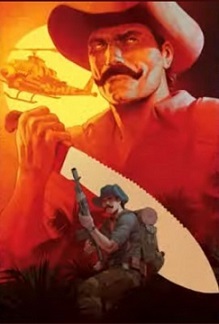 Isnt there something so magical and nostalgic about the arah classic covee art?